Home battery storage systems have been getting their fair share of media exposure lately, the Tesla Powerwall battery launch got everyone talking and a number of energy storage companies are targeting Australia as a key market to launch their products into. Over the past few years we’ve also seen some rather large electricity price increases and many electricity retailers have gotten away with treating their customers like dirt. Combine this with low solar feed in tariffs, a large amount of residential solar installations and a climate with its fair share of sunlight and you’ve got a recipe for a battery storage revolution. We’ve had a lot of enquiries about off-grid and hybrid grid-battery systems lately as people look for alternatives, where they can reduce their electricity bills and become more independent from the grid. Despite all the hype around battery storage, for most people in Victoria, the economics won’t add up just yet. Off-grid systems can make a lot of sense when you’re presented with a $30,000 grid-connection charge as the alternative, but those with a reliable grid connection will find it harder to make an economic case for batteries right now. What’s a Battery Ready Solar system? With battery prices set to drop by 60% in the next five years, there’s a lot of talk about ‘battery ready’ or ‘battery compatible’ solar systems for those that aren’t quite ready to take the plunge. We’re hearing these terms thrown around a bit, so we thought we’d take a look at what it means and what to look out for. In this post I’ll generally be speaking about grid-battery solar systems, as this is what will be relevant for most people, but some solutions will be suitable for upgrading to going off-grid too. There are a number of ways to make your solar system ‘battery ready’, some might even argue that just by having a grid-connect solar system installed it is ready or compatible with batteries; you just need to add the storage, an inverter, and the battery management system. Be aware that battery storage systems come in a few different forms and have lots of different features. Here are a few examples of different approaches to battery ready systems. Enphase Energy is releasing their AC battery in mid-2016. It’s a 1.2kWh easily expandable modular solution designed specifically for solar self-consumption (no blackout proofing yet). Their plans for a home energy management platform are impressive and they have already demonstrated how their platform can deliver benefits to the electricity grid. If you’re looking to get battery ready for the Enphase solution, simply install their new ‘Envoy’ monitoring gateway (due out early 2016) with consumption and solar production monitoring and after collecting information about your scenario they will size the battery to best suit your situation. Each Enphase AC battery includes its own microinverter and can be AC Coupled with Enphase’s own solar microinverter systems or retrofitted to an existing grid-connect, string inverter solar system. The great thing about this solution is that it’s compatible with any standard grid connect solar system. Pricing is expected to be around the $2,000 mark as a starting point for their 1.2kWh battery. Fronius have been making battery charging systems since 1945. The Austrian company take a different approach. If you are installing a new grid connect solar system, you can install one of their battery ready hybrid inverters. Their Hybrid inverter solution manages connections to both the solar and battery systems, this is a DC coupled solution meaning you only require one inverter in total. To be truly battery ready, we’d recommend you install the Fronius smart meter in the switchboard to monitor your consumption for accurate battery sizing later. Fronius are a Tesla partner and their inverters are compatible with the new Tesla Powerwall home battery, which is expected to be released with 7kWh of usable battery storage. Fronius also have their own modular battery solution. Please note that at the time of writing there is no single phase ‘Primo’ hybrid inverter solution available in Australia yet (due sometime in 2016), only their three phase ‘Symo’ hybrid inverter is available. It’s probably worth noting that the Fronius inverter can also be setup as an AC coupled unit, pairing with an existing Fronius grid-connect solar inverter if you have a single phase meter and don’t want to wait. If you’re looking at a system that will eventually take you off the grid, providing you with full autonomy and independence, we partner with Off-Grid Energy Australia to provide an expandable lithium-ion battery solution, using the German manufactured SMA inverter complete with smart home management system integration. The German manufactured, Off-Grid Energy Australia, BMZ battery (Sony cells) come in modular 6kWh units and can deliver up to a whopping 15kW of power to you home, making this an unrivalled solution in the Australian market. Many other Lithium-ion battery solutions will restrict the peak output from the battery meaning that you may not be able to power multiple appliances in the house at the same time. 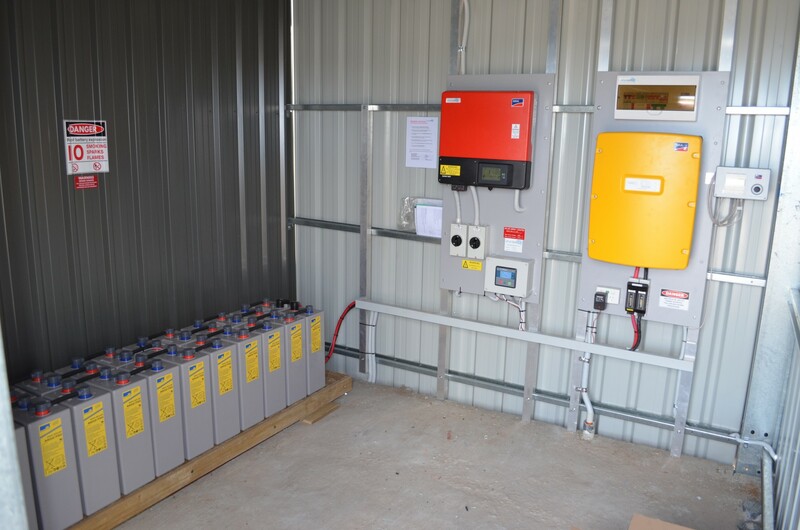 To install a battery ready SMA system we can simply install a standard SMA grid-connect solar inverter system with consumption monitoring and the battery inverter and batteries can be added later. Note that the SMA range of battery inverters offers flexibility and is expandable with 6kW & 8kW unit options that can offer power layering from the solar, the grid or generator above what’s supplied from the batteries. Although this is not a battery ready system, it’s a system with an actual battery included, I thought it’s worth touching base on to give an idea on the different types of systems out there. Samsung ESS (Energy Storage System) is a compact solution which includes a hybrid inverter for the solar and the battery as well as the battery and energy management system, all you need to do is add solar. Note that their smaller system has 3.6kWh of storage and does not provide emergency backup if the grid goes down, while their larger unit is scalable to 10.8kWh of storage and does have an off grid mode. The peak inverter output in these units is 4.6kW and 4.98kW respectively. Probably the most important thing to know when selecting a battery ready solar system is that nearly all the options out there will lock you into using their particular product or storage system, so when you’re making a decision on a battery ready system think about the company behind the solution, what features you want, and remember choose carefully because you’re not just purchasing a battery storage system, you’re buying part of a home energy management system. Most people installing a grid-battery system in Australia over the next few years will be looking to install batteries so they can capture excess solar for use at night rather than selling it into the grid at a low rate. Some systems are designed specifically for increasing solar self-consumption and won’t have the ability to provide power when the grid goes down. Solar self-consumption systems that don’t have blackout proofing will generally be cheaper and for many who live in areas where the grid is highly reliable will be a suitable solution. When it comes to blackout proofing, each system will be different, the appliances that you can run when the grid goes down will be dependent on the inverter capacity, the battery size and the peak output of the battery pack. In some cases appliances will need to be split into separate circuits, with only the essential items wired for use in backup mode. Other systems will not allow you to use the solar when the grid goes down and will only give you access to what’s already stored in the battery. Some storage options allow you to start off small and increase the battery storage capacity incrementally; these systems can make the initial cost of battery storage more accessible, while accommodating the needs of a growing family or changing energy usage. Return on investment can be optimised when battery storage systems are sized correctly; modular systems allow a lot of flexibility here to get the size of your battery right. It’s probably worth looking at your battery storage system as part of a home energy management system. It’s important to consider the other parts of the system like your solar array, controlling the switching of other electrical appliances (like hot water, pool pumps, washing machines, etc) and how they will interact together through a monitoring or control system. If you’re looking at a battery ready system, do some research into the brand of inverter you’re looking at and see what plans the company has for the future, are they looking at a total smart home package, that allows you to see and control things on a good online portal. If you want to manage the energy use in your home to help reduce your electricity bills, you want the monitoring platform to be easy to use. Different systems will use different battery technologies, I’m not going to go into too much depth here, but most on-grid battery systems are using some form of Lithium-ion battery technology rather than the traditional lead acid type batteries. Lithium batteries generally have a thermal cut out at around 40-45 degrees Celsius, so you’ll need to think about where you install them, hot sheds might cause some issues. There’s also a range of other new battery storage technologies at various stages of commercialisation including a number of variations of Lithium-ion technology, sodium-ion, lead acid ultrabattery, flow batteries and more. As with all new technologies, do your research and take the marketing pitches with a grain of salt. If you’re looking to eventually cut the cable and take your home off-grid there are a number of products that won’t do it. It’s really an extension on blackout proofing; you need to make sure the inverter capacity and peak output of the battery bank can cater for your needs and the battery capacity can be scaled to cover your energy storage requirements. If you’re thinking about an eventual off-grid solution, you may want to consider setting up your solar array to be optimised for winter; this will help to keep your batteries topped up when they most need it and minimise any generator run time if you do eventually cut the cable. Article by Aaron Lewtas, Director at Green Energy Options. The first two that come to mind are the Enphase AC Battery, and Tesla Powerwall 2. There are possibly some other options available but may have limitations to functionality. You best bet would be to call our office (08) 8241 5017 to speak to one of our consultants about the options.